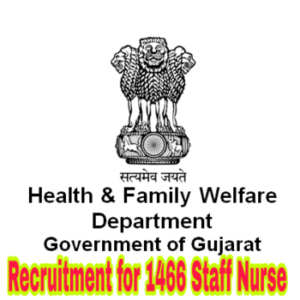 Commissioner Of Health, Medical and Medical Education (Medical Services), Government of Gujarat has released notification for recruitment on 1466 posts. The Government of Gujarat Recruitment 2018 is for the appointment on Staff Nurse Class -III posts. The eligible aspirants can apply online before the closing date i.e. 21 June 2018. The willing aspirants are advised to go through the complete advertisement to know the recruitment process like details of posts, educational qualification, selection process, important dates, age limit etc. Interested aspirants should check the complete eligibility criteria before applying for the posts. How To Apply For WBHRB Recruitment 2018: The eligible aspirants may apply online through the official website from 09 June 2018 to 21 June 2018. Aspirants should download the advertisement notification for more details. Maximum Age (in Year): Should not be more than 40 years as on 21 June 2018. Application Fees: Unreserved applicants are required to pay an examination fee of Rs.300/-through Post Office. And there is no fee for reserved applicants. Applicants should have passed Diploma in General Nursing Midwifery or B.Sc. (Nursing) recognized by Indian Nursing Council.